Sam Baldock has left Albion to join Championship side Reading on a three-year deal for undisclosed terms. 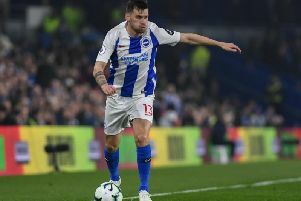 The 29-year-old joined Brighton in August, 2014, and scored 12 goals in all competitions as the Seagulls were promoted from the Championship in the 2016/17 season but he played just five times last year. In total, Baldock netted 20 times for Albion in 94 matches and Seagulls manager Chris Hughton said: “Sam has been a pleasure to work with during my time here, and he played a key role in our journey to the Premier League. “His attitude and professionalism has been excellent, especially after not having as much game time as he would have liked last season.